Syrus retired to a pet home in September of 2002. Then 6 months later, as is the nature of the breed, he escaped from his kennel and went after a neighbours pet pig. He was put down on his 8th birthday, March 27th, 2003. He is missed dearly by all those who loved him. Syrus shown winning Best Puppy in Group at the Calgary Kennel and Obedience Club show in November of 1995 at eight months of age. 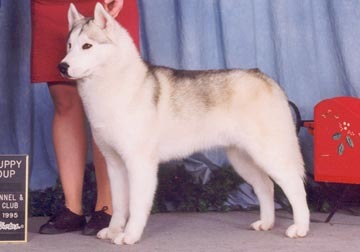 Just two months later he won 'Best puppy in Specialty' at the Canadian Rockies Siberian Husky Club Specialty Show. Syrus is grey and white with brown eyes. He stands 22 1/2 inches at the shoulder. AM/CDN CH BLACKOAK'S CRESCENDO (USA)C.D. AM CDN CH NAAKEAHS CATCH T'SPIRIT O'KABU S.D.X. CDN CH SEKENE'S ROYAL CIN AM/CDN C.D.